I really really liked this book, I found it on one of the fb pages and I said there that I hoped that this book would be good because most books I read are okay or just fun. And I’m so happy to tell you that this was so good, I really hated the fact that I finished the book and I have to wait until august. Still I love waiting on good books and love reading more of the characters. I like the MC Sera, I like that she isn’t the fighting type, the look at me how good I’m with these swords, I like that she is different and that she needs to relay on her other talents like her mind. That she is cursed is a fun thing and I want to know why she is like that, why the princes are reacting to her like this, I can’t wait how it all goes further. I like the writing style and how the story flows. I love the world Clara build and how everything works in that world. I can related to so much in this book and would love for living in it. 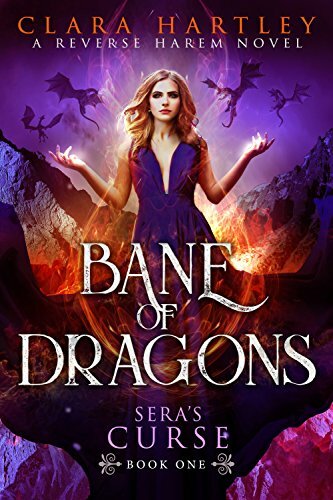 The book has a steady pace and is a real slow burn reverse harem, which is fine only I missed a little more spark in that department. Still hoping for the next book. I really liked it, and I can’t say it enough. Thank you Clara Hartley for writing this you made my day.